A Yukon Supreme Court justice has agreed to briefly extend several placer mine claims in the Dawson City area. 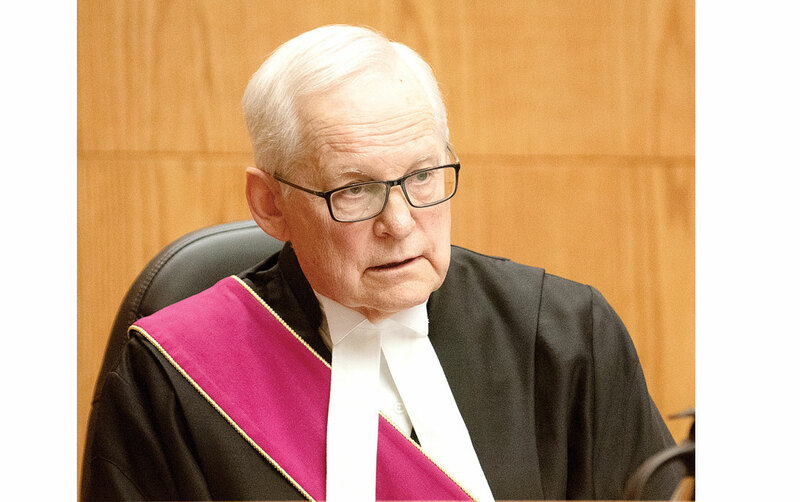 Michael Heydorf and Michel Vincent pleaded their case to Justice Ron Veale last Thursday. The men’s claims are located on land making up a Tr’ondëk Hwëch’in First Nation subdivision. They own seven claims, but five were set to expire last Friday. Before the hearing began, Veale heard a request from Ewa Holender, a lawyer representing Tr’ondëk Hwëch’in. The First Nation wanted to be recognized as a party defendant in this case. The justice approved the request. Moving to the application from the claim owners, Veale pointed out the statement of claim appeared to be drafted by an attorney. He asked both Heydorf and Vincent if they wanted to be represented by a lawyer. Heydorf said neither he nor Vincent needed legal representation. Veale accepted that, but still felt they should use their lawyer since one was available. Heydorf told the court that they do not want to see their claims expire. He said he wants to have a trial regarding the circumstances that have prevented him from pursuing his claim. He did not provide any specific information on the circumstances. Veale asked Heydorf to point him to any provisions in the Yukon Placer Mining Act that would give him the authority to extend the claims. Heydorf said neither he nor Vincent are relying on the act for their request. He is relying on the Canadian Constitution. He reasoned that when there are conflicts in legislation, the Constitution should take precedent. He said the claims have existed well before the land in question became settlement land. This meant, he explained, the claim should operate as if it is not on Crown land. Veale interjected, saying that both men still have access to the land, but to do anything with the claims, they would have to follow the act. Vincent said it is a catch-22. He agreed that he can still walk onto the land but neither man can exercise his rights. Veale said they have to talk to the Yukon Mining Recorder and file a class one notification of mining activities. From there, they would have to consult Tr’ondëk Hwëch’in. He pointed out neither Heydorf nor Vincent had taken these steps. Heydorf maintained that the Constitution is supposed to take precedence over law. He clarified that he does not care if the First Nation received settlement land as long as he could still mine his claim. He stood firm on his position that the agreement set out that the land was to be treated as if it was not settlement land. Territorial Crown prosecutor Julie DesBrisay said Heydorf and Vincent were required to submit the class one notification as per the act no matter the land designation. Holender pointed out that the duty to consult the Tr’ondëk Hwëch’in also applies to Crown land, provided the placer mining activity has an effect on the First Nation. She added this allows the territory to consult First Nations. Holender agreed with DesBrisay, saying the class one notification would apply in this case regardless on the designation of the land. Veale asked Heydorf to address this point, since it appeared it would “due in” his arguments. Heydorf said that not every placer miner was required to fill out a class one notification. Veale interjected, saying that on Nov. 28, 2017, both men had to file the class one. Heydorf agreed, but maintained that not everyone did. He explained that the only people that needed to make the filing were placer miners in conflict with the First Nation. “We were not treated as if we were on Crown land,” Heydorf said. DesBrisay maintained that Heydorf and Vincent were required to make their filings. Veale said the placer miners are trying to navigate a legal maze and thus they really should have a lawyer presenting arguments for them. Holender argued that the two men are responsible for their own misfortune. All they had to do was make the appropriate filings. She explained that nothing was preventing them from pursuing their claim. As for the extension, DesBrisay said only five out of the seven claims were set to expire. The other two will expire in 2019. She said neither man had an excuse to delay his claims to the day before the expiration date. “There was plenty of time to file the statement,” she said. She added that the mining recorder cannot extend claims. Veale commented that there is a hurried nature to the case. He added there was no case law presented by Heydorf and Vincent. He clarified he was not saying the placer miners were wrong, but there should be some case law to show if a judge could or could not extend the mining claim. Both Holender and DesBrisay said they would prefer it if Veale declined the extension. Holender said if an extension is granted, it should be short, and there should be an order baring physical work on the site during the extension. She reasoned that this was because the situation is Heydorf’s and Vincent’s fault. DesBrisay agreed. She proposed an alternative if Veale was considering the extension. She proposed letting the claims expire, and should they win at trial, the class one notification can be retroactive. She explained there would be a prohibition order and thus no one could come in and take their claim from under them. Heydorf expressed apprehension with this suggestion. He felt it would complicate the matter. He explained that while no one could take the claim away from him, someone could come up with a new plan for the land and build something like a hotel. “It’s good ground to build on,” he said. With these arguments, Veale decided to extend the claims to the date of the next hearing, which he set for Jan. 21, 2019. He ordered that there will be no activity on the site in question. Veale also ordered all parties to provide submissions on Section 42, Subsection 3 of the Placer Mining Act. This part of the act covers forfeiture of claim, and he believes the act will be significant in the case. I had the privilege to have many first nation friends and I have asked them the question if they felt their resources were compromised because of the placer miners... they all said no. One thing for sure something smells like dead fish around Dawson city. First nation traditional territory was supposed to be a place where they could hunt and live for free, nothing was ever said that they could have an input about mineral rights. Now most placer miners are more or less at the mercy of first nations as far as being free to work future potential ground. I am prepared to predict that in the near future things will get even worse.